M decided several months ago that she was going to have a “horsie party” for her 3rd birthday yesterday. She even collected together my cake books and searched through them until she found the cake she wanted. Which cake did she choose? 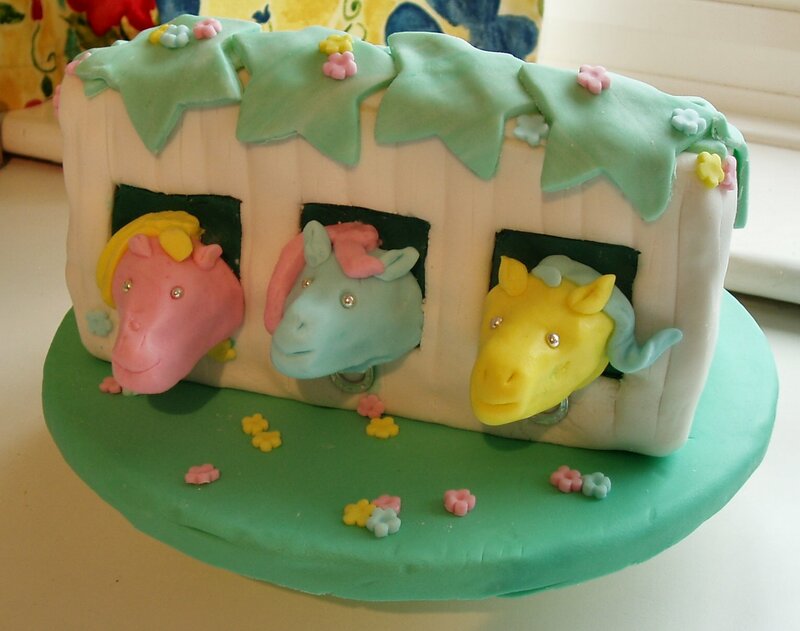 … a stable full of ponies from Debbie Brown‘s 50 Easy Party Cakes. It was worth it though. M was so pleased and proud to show off her birthday cake to the three little friends who came to her ‘horsie party’ yesterday afternoon. Oh my I feel your pain… The pressure that builds up around birthdays is unbearable, and if you’ve set precedents with one sibling, then you’re doomed. My (3) kids don’t know yet that birthday cakes can look like anything other than a round with a few candies on top, and I pray they don’t discover it too soon! Anyway you did a fabulous job. Of course you know that means you’ll have to do even better for the next birthday! That is so true! … I’m dreading August, when my elder daughter turns 6 … what will she choose?? Aaargh! What a lovely cake for your little girl, she must have been thrilled! Say Happy Birthday to her from me. Kate, Your cake looks perfect! when my daughter was 5, she would have wanted this cake too. She was My Little Pony crazy. I even used to know the ponies names and play with her. We made flower place mats out of card. Anyway, we got very flower power mad! I kind of miss the special party stuff. It all pretty easy and low key. Darn! So enjoy those powdered sugared evenings. It really does not last forever. Your pony stable is ab fab! It will be strange in the next year or so having to think about a cake for a boy … I’m so used to the girly things with my eldest two! L is talking about a jewellery box with ballet shoes for her birthday in August – help! You’re right though, Melinda. I’ll miss it when they’re too sophisticated for my lumps of fondant icing. Hi Charlotte! Thanks (this fondant icing thing is a mixed blessing – I should practice more with play dough and then perhaps I wouldn’t have nightmares about it each year!). 😳 – I *will* post the curry and crumble recipes, I promise! Gorgeous cake Kate! Well done! Wow, coping with one party cake a year is enough for me! You are a legend doing three!! If you are game, maybe try making Marshmallow Fondant next time. It’s not common here but I adapted a US recipe and make it in minutes flat in the Kitchenaid – so quick and easy and stores wonderfully. It’s not _quite_ 100% from scratch as you buy the marshmallows and melt but I found it so much more forgiving to use on my little boy’s cake than regular fondant. The bonus is the taste is more to a child’s liking than traditional fondant! Email me if you want the adapted recipe!